This cheerful little polka dotted sushi plate was made with a multitude of colors. 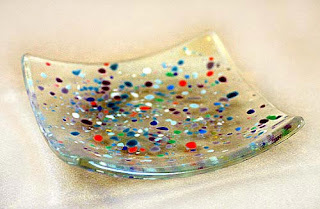 Various bits of colored glass melted fully into the four inch square clear glass base. They where then cold worked for a smooth round edge and satin finish. Finally the piece was kiln formed into this gently slumped shape. Intended to be a fun and simple piece. With all this time off my feet I haven't been able to do much else except sleep, watch bad television and read. I much prefer reading. Here are a couple of the books I have enjoyed the last couple of weeks. This was actually a recent re-read. I first came across this book several years ago as part of a book club. It is not entirely uncommon that I re-read a book but it is particular kind of book that calls me back time and again. The Glass Palace is a fabulous compilation of stores all intertwined. Just as our lives often do not follow one straight forward plot line the author of The Glass Palace captured the lives and stores of several characters all weaved into one overall story. A story that spanned several cultures and decades it begs to be read and re-read. 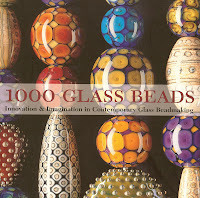 1000 Glass Beads is less a book to read then peruse. 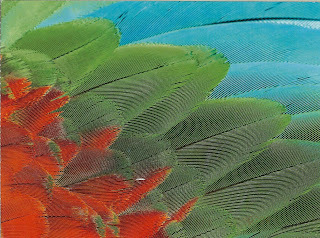 One of many of Larks' recent compilations on a particular topic, this one focuses on Glass Beads. The majority of beads appear to be flame worked but there were also some kiln formed examples. As with any collections there are amazing examples included in the book, but also many mediocre and some just plan bad work featured. The fun was flipping through to see them all. On several occasions recently (i.e. Sol Lowitt x2, The Tacoma Museum of Glass) I have mentioned how I like to purchase exhibit programs so I can later relive the experience, as a way to remember. Glass of four millennia is a program of the historic collection of glass held by the Ashmolean Museum. Although in this instance I am reading as a way to visit a collection I can not see in person. As I am not about to travel anywhere at the moment this was a way to escape, learn and experience the collection all from the comfort of my coach. July 10th Inspire Me Thursday posted a creative prompt on healing. It was very timely for me, as I have spent the last two weeks doing exactly that. So although I am quite late with a response please consider I have been focusing most of my time on the act of healing itself. 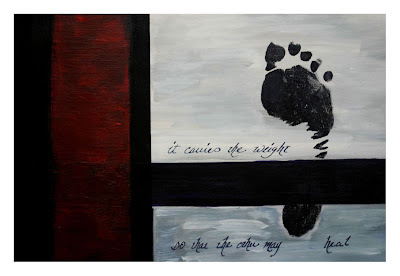 Acrylic on canvas - "It carries the weight so the other my heal"
If I am absent for a few days... maybe a couple of weeks, it is only because I am taking some necessary time to take care of myselft, rest and recupperate. I'll be back soon enough so don't stray to far. We all have things we are attracted to. Patters or colors we keep coming back to. Objects we like to collect. For me that list includes leaves, bridges and postcards. 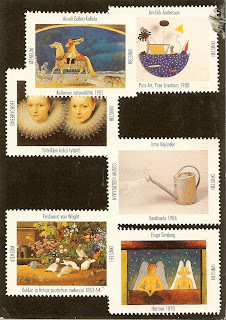 When it comes to postcards I love to collect them on my travels. I send them to friends and family even myself. I love everything about them; the cards themselves vintage or new, the idea of written communication traveling across the miles, the postage and postmarks… all of it. So you can imagine my response when I came across Postcrossings.com. Although I have only participated a short time I have really enjoyed my experience. For starters I love getting something other then just bills in my mailbox. Here included are a couple of my favorites. 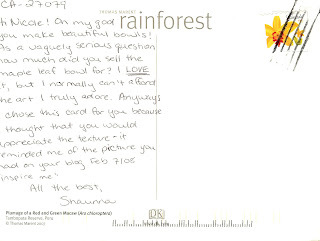 Here is one of my favorite postcard tips. 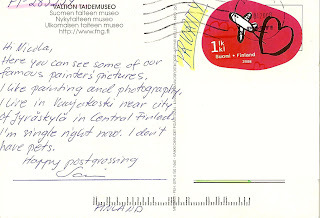 When traveling purchase a postcard each day of somewhere you visited. Take a couple of moments to write a little something about the day. Then mail it to yourself. In most cases hotels will carry the postage and are glad to drop them in their outgoing mail for you. When you arrive home the postcards will start to trickle in if they haven’t already beaten you back. You will be able to relive your trip. In addition, you just very efficiently documented your trip with pictures, text and postage all about the places who visited.